Next time you or someone you love is about to be transported in an ambulance to the closest hospital, you might want to hop in the back of the vehicle and give the driver directions using your cel phone navigation GPS system. Why? 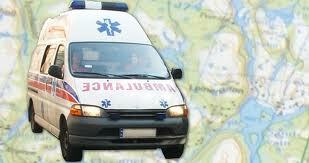 Because many ambulances are not equipped with a GPS navigation system that gives drivers directions. Instead many ambulances are equipped with a GPS tracking system that is only used to keep track of the vehicle’s location, but this type of global positioning system (GPS) is not able to give driving directions. It is important to recognize the differences in the capabilities of these two types of GPS tracking systems. What this means is that ambulance drivers are still forced to rely on paper maps to get to and from emergency destinations in a hurry. In emergency situations, every minute counts. This isn’t exactly confidence-inspiring and seems a bit archaic. The benefit of this type of fleet GPS tracking system is that emergency system dispatchers can identify and dispatch the closest emergency vehicle, meaning the response time to emergencies is greatly reduced. Obviously this is a good thing, but ambulance, police, and fire truck vehicles should all be equipped a with a GPS system that not only tracks their location in real-time but also has navigation with driving directions. According to a recent article in the NY Daily News, NYC installed a GPS fleet tracking system into every one of the city’s 236 ambulances. Each fleet GPS tracking system cost the city taxpayers around $10,000 per ambulance. And they don’t give driving directions?! This just seems outrageous! If a fleet tracking system costs $10,000 per vehicle, it should come with navigation features!!!! In contrast, the FieldLogix GPS fleet tracking system only costs a few hundred dollars per vehicle. FieldLogix fleet GPS not only gives driving directions, but it uses telematics technology to track dozens upon dozens of items – such as engine diagnostics, driver reports, and other useful fleet management reports.